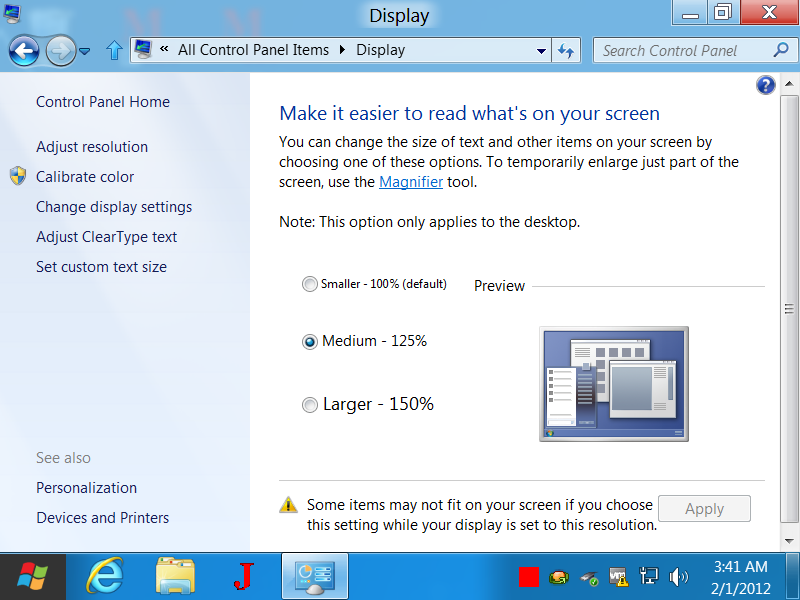 Screen Resolution of a Windows 8 computer can be viewed and changed using Display Settings of Windows 8. 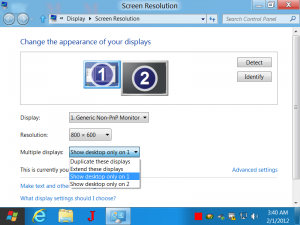 Right click on an empty desktop area and click on the Screen Resolution menu as displayed below. The Screen Resolution control panel option allows to view the Screen Resolution, Available Monitors to connnect to and many more useful Display Controller Settings. 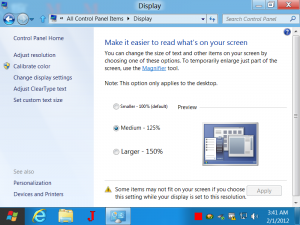 As displayed in the figure below, the Screen Resolution Control Panel Item allows to view or change settings related to all display devices connected to the Windows 8 Computer. In case you do have a projector connected to your desktop or laptop running Windows 8, this Screen Resolution option will allow you to configure and setup your projector or other display devices such as CRT Monitor, LCD Monitor, etc. Apart from controlling Resolution of Display Devices, this Control Panel option allows to view and manage other aspects that control what you actually see on your Windows 8. The Screen Resolution controls the display text and images. Higher the Resolution, better quality of text & images and lower the screen resolution, size of text, images, videos will appear bigger. The Screen Resolution is controlled with various hardware and software factors such as Resolution Supported by the actual Display Device, Resolution supported by the internal or external graphics card, installed display drivers and ofcourse your current selection. There are other aspects apart from Screen Resolution which can be used to control actual display text, images, etc on your display device(s). 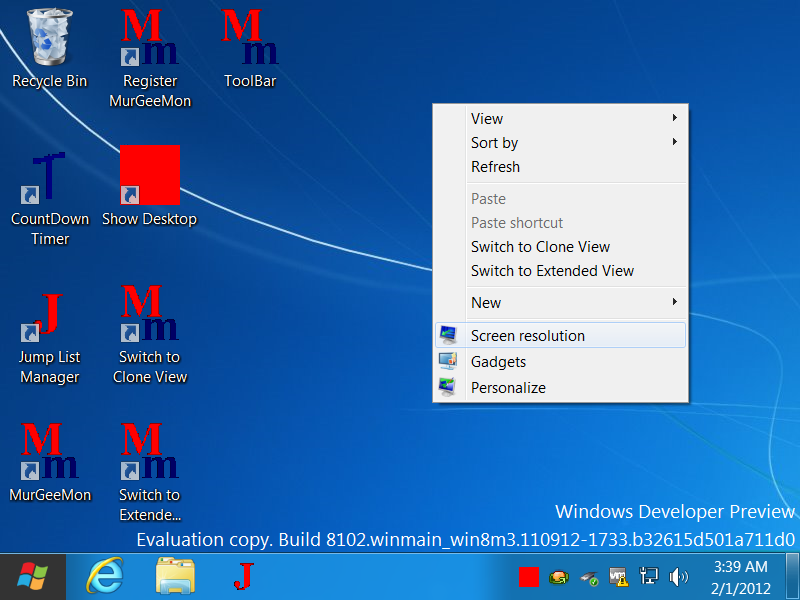 Rest of this post will briefly outline the other factors which you can control using the Screen Resolution option of Windows 8 and other Control Panel Option. 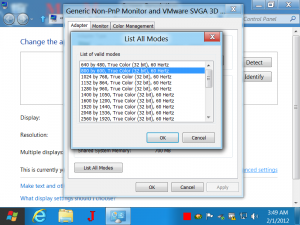 In case you are using a CRT Monitor connected to your Windows 8 computer, you might be interested in setting up a custom refresh rate for your monitor. 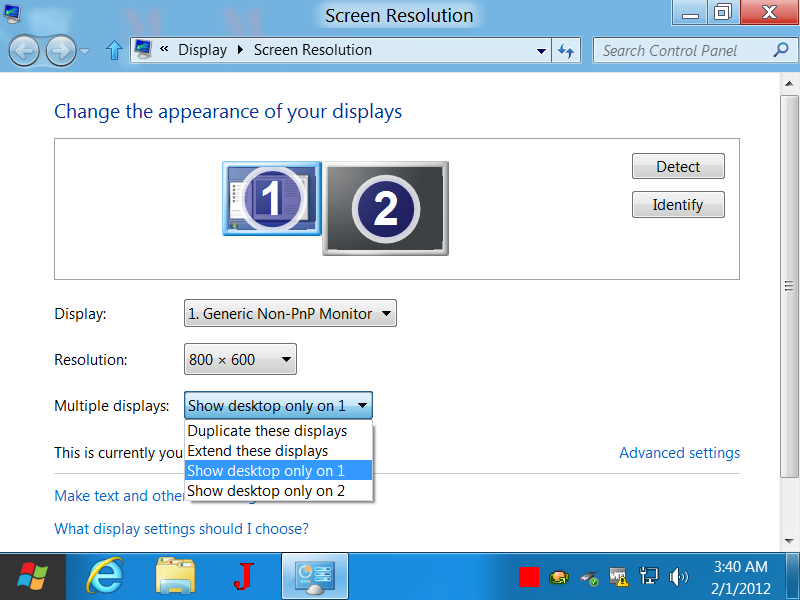 Normally you would not want to change the refresh rate of your Connected Monitor, however in case you would like to know what all display modes are supported by your monitor, then click on the Advanced Settings option in the Screen Resolution Control Panel Item and locate and click on the List All Modes button. In case you would like to increase or decrease text / images size on your Windows 8 computer, yes you do have options for that. 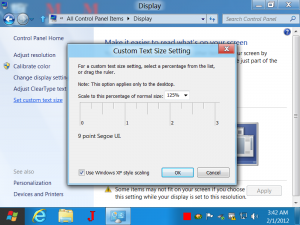 The Display Settings as displayed below allows to make Text Smaller or Larger and can be useful when you do have eye sight issues or you want to view the display on your display devices from a distance. 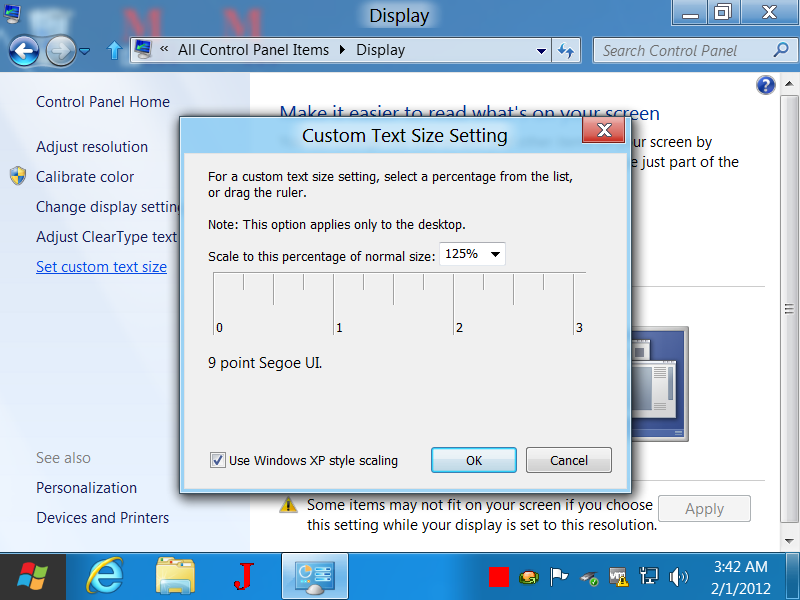 Yes there are options in Windows 8 to setup custom text size apart from the display settings as outlined in this paragraph. Icons Size is also configurable in Windows 8 as in other previous versions of Windows for Desktop and for Windows Explorer. 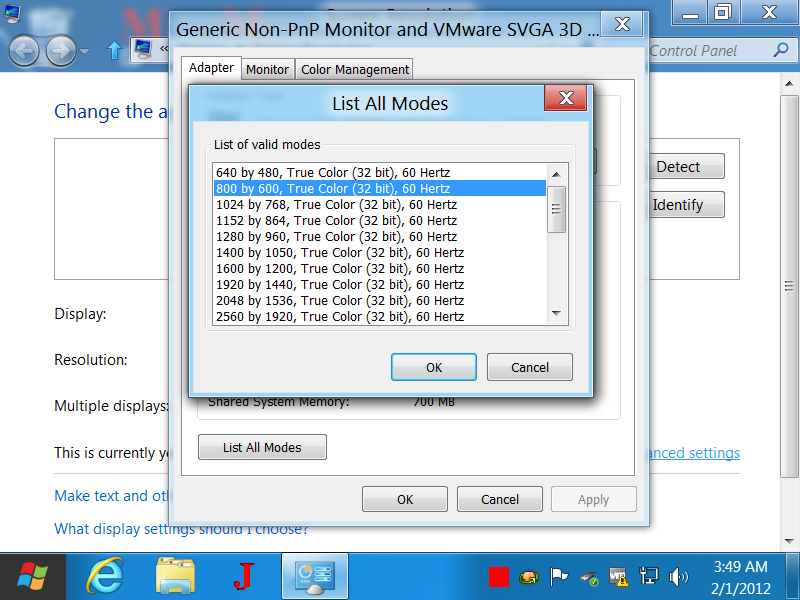 Windows 8 does boats of better display and more number of icons for the same display resolution. Windows 8 has also improved display support for Display Devices connected in Landscape or Portrait Mode. 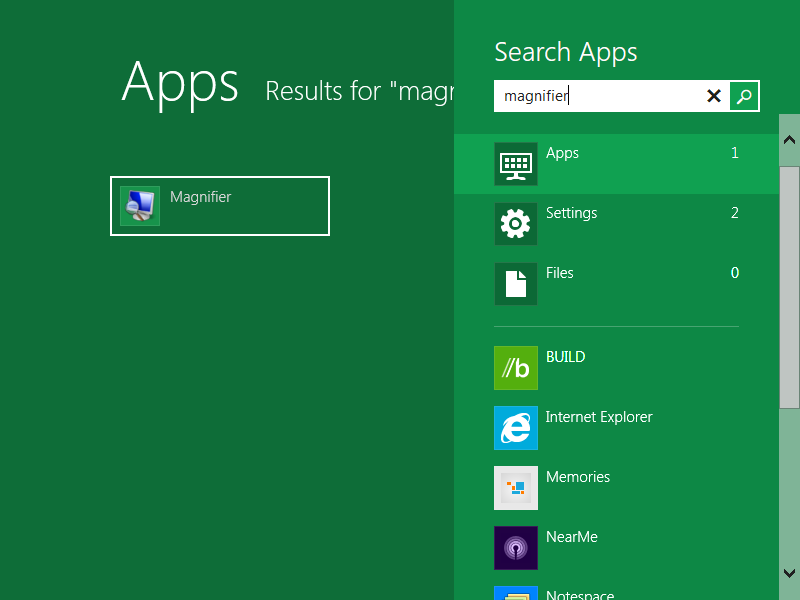 Screen Magnifier is also available in Windows 8 and can be used to open up Magnifier and magnify any part of the Screen. 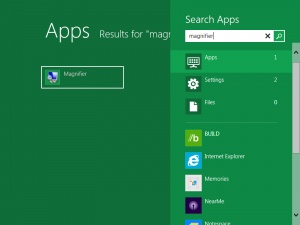 In order to open up magnifier, open up the Search (by pressing Windows Key + F) and type in magnifier, locate the Magnifier in Apps category and launch it as displayed in the screenshot below. 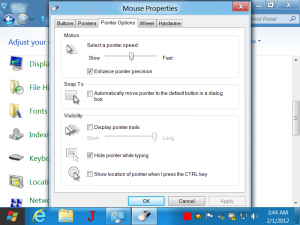 As we all use Mouse Cursor to navigate to any part of Screen, Launch applications and do more with the Mouse Cursor, the Mouse Properties can be used to change the mouse cursor , change schemes, enable or disable mouse trail, locate mouse cursor on screen using Ctrl Key and much more. Having read and seen lots about Windows 8, you might be wondering whether you can try out all those settings on a Windows 8 computer yourself, yes Microsoft is offering free trial of Windows 8 targeted towards software developers and yes you can Download Windows 8 in a .iso file. There are other attributes which control what you actually see on your screen apart from the screen resolution and yes windows 8 provides easy and quick ways to configure and control them. 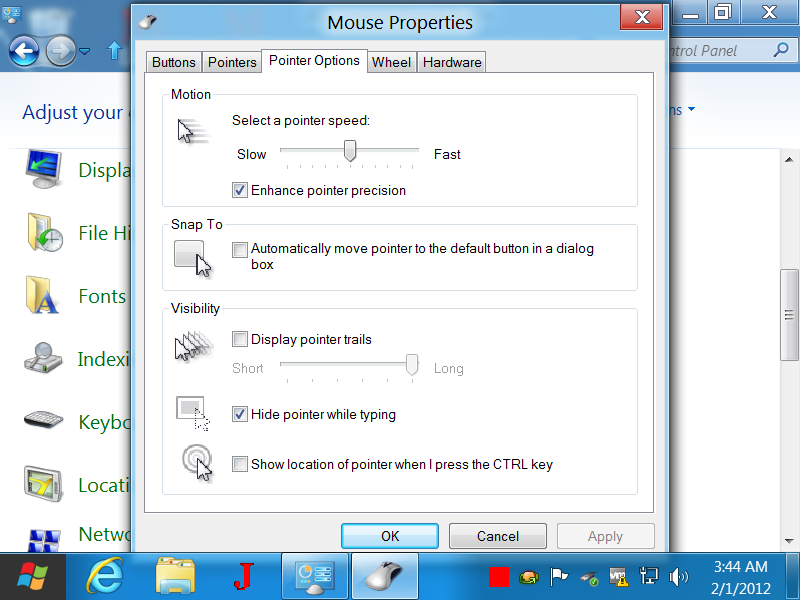 All the parameters when controlled appropriately can give you best display output and productivity from your Windows 8 computer.